Explore the entire truck lineup at our dealership. Then, reach out to us with further questions about the truck that receives stellar reviews from Cars Dot Com drivers across the nation. Sunroof, NAV, Heated Leather Seats, 4x4, ENGINE, DURAMAX 6.6L TURBO-DIESEL V8, B20-DIESEL COMPATIBLE, Turbo, Alloy Wheels, Tow Hitch, ALL TERRAIN HD PACKAGE. ONYX BLACK exterior and JET BLACK / SPICE RED interior, SLT trim. CLICK ME! KEY FEATURES INCLUDE 4x4, Back-Up Camera, CD Player, Onboard Communications System, Trailer Hitch, Chrome Wheels, Remote Engine Start, Dual Zone A/C Privacy Glass, Keyless Entry, Alarm, Electronic Stability Control, Adjustable Pedals. OPTION PACKAGES DURAMAX PLUS PACKAGE includes (L5P) Duramax 6.6L Turbo-Diesel V8 engine, (DQS) outside memory equipped heated power-adjustable vertical trailering mirrors, (MW7) Allison 1000 6-speed automatic transmission, (UQA) Bose premium audio system, (UD5) front and rear park assist and (IO6) 8 diagonal Color Touch Screen Navigation with GMC Infotainment, ALL TERRAIN HD PACKAGE for Crew Cab models only, includes (CGN) spray-on bed liner, (QGM) LT265/70R18E all-terrain, blackwall tires, (UD5) Front and Rear Park Assist, (Z71) Off-Road Suspension Package, (NZZ) underbody shield, all terrain grille insert with body color grille surround with chrome accents, (UVD) heated steering wheel, (VB5) front body-color bumper, (VT5) rear body-color bumper with Cornerstep, (DP6) Black painted mirror caps, (D75) body color door handles, (B86) body color side moldings, Black belt moldings, Black skid plate, sill plates, (RIA) floor liners, LPO and (RVS) 4 black round assist steps, LPO. Includes (AN3) front leather-appointed bucket seats and (UQA) Bose premium audio system. SUNROOF, POWER, SEATS, FRONT FULL-FEATURE LEATHER-APPOINTED BUCKET with (KA1) heated seat cushions and seat backs. Includes 10-way power driver and front passenger seat adjusters, including 2-way power lumbar control, 2-position driver memory Plus tax, title and license. Prices include $200 dealer doc fee. See dealer for Stock Numbers. Price contains all applicable dealer incentives and non-limited factory rebates. You may qualify for additional rebates; see dealer for details. Sunroof, NAV, Heated Leather Seats, ENGINE, DURAMAX 6.6L TURBO-DIESEL V8, B20-DIESEL COMPATIBLE, Tow Hitch, 4x4, Turbo, Alloy Wheels, ALL TERRAIN HD PACKAGE. ONYX BLACK exterior and JET BLACK / SPICE RED interior, SLT trim CLICK NOW! KEY FEATURES INCLUDE 4x4, Back-Up Camera, CD Player, Onboard Communications System, Trailer Hitch, Chrome Wheels, Remote Engine Start, Dual Zone A/C. Privacy Glass, Keyless Entry, Alarm, Electronic Stability Control, Adjustable Pedals. OPTION PACKAGES DURAMAX PLUS PACKAGE includes (L5P) Duramax 6.6L Turbo-Diesel V8 engine, (DQS) outside memory equipped heated power-adjustable vertical trailering mirrors, (MW7) Allison 1000 6-speed automatic transmission, (UQA) Bose premium audio system, (UD5) front and rear park assist and (IO6) 8 diagonal Color Touch Screen Navigation with GMC Infotainment, ALL TERRAIN HD PACKAGE for Crew Cab models only, includes (CGN) spray-on bed liner, (QGM) LT265/70R18E all-terrain, blackwall tires, (UD5) Front and Rear Park Assist, (Z71) Off-Road Suspension Package, (NZZ) underbody shield, all terrain grille insert with body color grille surround with chrome accents, (UVD) heated steering wheel, (VB5) front body-color bumper, (VT5) rear body-color bumper with Cornerstep, (DP6) Black painted mirror caps, (D75) body color door handles, (B86) body color side moldings, Black belt moldings, Black skid plate, sill plates, (RIA) floor liners, LPO and (RVS) 4 black round assist steps, LPO. Includes (AN3) front leather-appointed bucket seats and (UQA) Bose premium audio system. SUNROOF, POWER, SEATS, FRONT FULL-FEATURE LEATHER-APPOINTED BUCKET with (KA1) heated seat cushions and seat backs. Includes 10-way power driver and front passenger seat adjusters, including 2-way power lumbar control, 2-position driver memory Plus tax, title and license. Prices include $200 dealer doc fee. See dealer for Stock Numbers. Price contains all applicable dealer incentives and non-limited factory rebates. You may qualify for additional rebates; see dealer for details. Heated Leather Seats, NAV, Sunroof, 4x4, Turbo, Alloy Wheels, AUDIO SYSTEM, 8 DIAGONAL COLOR TOUCH... ENGINE, DURAMAX 6.6L TURBO-DIESEL V8, B20-DIESEL COMPATIBLE. SUMMIT WHITE exterior and JET BLACK DENALI interior, Denali trim CLICK NOW! KEY FEATURES INCLUDE Leather Seats, 4x4, Heated Driver Seat, Cooled Driver Seat, Back-Up Camera, Running Boards, Premium Sound System, Onboard Communications System, Trailer Hitch, Aluminum Wheels, Remote Engine Start, Dual Zone A/C, Heated Seats, Heated Leather Seats, Heated/Cooled Seats. Keyless Entry, Privacy Glass, Steering Wheel Controls, Electronic Stability Control, Alarm. OPTION PACKAGES DURAMAX PLUS PACKAGE includes (L5P) Duramax 6.6L Turbo-Diesel V8 engine and (VQY) chrome recovery hooks, LPO, (MW7) Allison 1000 6-speed automatic transmission (Includes (DQS) outside memory equipped heated power-adjustable vertical trailering mirrors. ), SUNROOF, POWER, MIRRORS, OUTSIDE HEATED POWER-ADJUSTABLE VERTICAL TRAILERING, MEMORY EQUIPPED, UPPER GLASS, POWER-FOLDING AND MANUAL EXTENDING, CHROME Includes integrated turn signal indicators, consisting of 51 square inch flat mirror surface positioned over a 24.5 square inch convex mirror surface with a common head and lower convex spotter glass (convex glass is not heated and not power-adjustable) and addition of auxiliary cargo lamp for backing up (helps to see trailer when backing up with a trailer) and amber auxiliary clearance lamp, LPO, ALL-WEATHER FLOOR LINER, ENGINE, DURAMAX 6.6L TURBO-DIESEL V8, B20-DIESEL COMPATIBLE (445 hp [332 kW] @ 2800 rpm, 910 lb-ft of torque [1220 Nm] @ 1600 rpm) Includes capped fuel fill, (K40) exhaust brake, and (K05) engine block heater. AUDIO SYSTEM Plus tax, title and license. Prices include $200 dealer doc fee. See dealer for Stock Numbers. Price contains all applicable dealer incentives and non-limited factory rebates. You may qualify for additional rebates; see dealer for details. Nav System, Heated Leather Seats, Moonroof, ENGINE, DURAMAX 6.6L TURBO-DIESEL V8... 4x4, Turbo Charged Engine, SUNROOF, POWER, Aluminum Wheels, Hitch, Bed Liner. ONYX BLACK exterior and JET BLACK DENALI interior, Denali trim SEE MORE! KEY FEATURES INCLUDE Leather Seats, 4x4, Heated Driver Seat, Cooled Driver Seat, Back-Up Camera, Running Boards, Premium Sound System, Onboard Communications System, Trailer Hitch, Aluminum Wheels, Remote Engine Start, Dual Zone A/C, Heated Seats, Heated Leather Seats, Heated/Cooled Seats Keyless Entry, Privacy Glass, Steering Wheel Controls, Electronic Stability Control, Alarm. OPTION PACKAGES DURAMAX PLUS PACKAGE includes (L5P) Duramax 6.6L Turbo-Diesel V8 engine and (VQY) chrome recovery hooks, LPO, (MW7) Allison 1000 6-speed automatic transmission (Includes (DQS) outside memory equipped heated power-adjustable vertical trailering mirrors. ), SUNROOF, POWER, MIRRORS, OUTSIDE HEATED POWER-ADJUSTABLE VERTICAL TRAILERING, MEMORY EQUIPPED, UPPER GLASS, POWER-FOLDING AND MANUAL EXTENDING, CHROME Includes integrated turn signal indicators, consisting of 51 square inch flat mirror surface positioned over a 24.5 square inch convex mirror surface with a common head and lower convex spotter glass (convex glass is not heated and not power-adjustable) and addition of auxiliary cargo lamp for backing up (helps to see trailer when backing up with a trailer) and amber auxiliary clearance lamp, LPO, ALL-WEATHER FLOOR LINER, ENGINE, DURAMAX 6.6L TURBO-DIESEL V8, B20-DIESEL COMPATIBLE (445 hp [332 kW] @ 2800 rpm, 910 lb-ft of torque [1220 Nm] @ 1600 rpm) Includes capped fuel fill, (K40) exhaust brake, and (K05) engine block heater. AUDIO SYSTEM MORE ABOUT US Chevrolet Buick GMC of Fairbanks sells new Plus tax, title and license. Prices include $200 dealer doc fee. See dealer for Stock Numbers. Price contains all applicable dealer incentives and non-limited factory rebates. You may qualify for additional rebates; see dealer for details. Moonroof, Nav System, Heated Leather Seats, 4x4, Bed Liner, Turbo Charged Engine, Aluminum Wheels, Hitch, AUDIO SYSTEM, 8 DIAGONAL COLOR TOUCH... SUNROOF, POWER. Denali trim, ONYX BLACK exterior and JET BLACK DENALI interior. CLICK ME! KEY FEATURES INCLUDE Leather Seats, 4x4, Heated Driver Seat, Cooled Driver Seat, Back-Up Camera, Running Boards, Premium Sound System, Onboard Communications System, Trailer Hitch, Aluminum Wheels, Remote Engine Start, Dual Zone A/C, WiFi Hotspot, Heated Seats, Heated Leather Seats. Keyless Entry, Privacy Glass, Steering Wheel Controls, Alarm, Electronic Stability Control. OPTION PACKAGES DURAMAX PLUS PACKAGE includes (L5P) Duramax 6.6L Turbo-Diesel V8 engine and (VQY) chrome recovery hooks, LPO, (MW7) Allison 1000 6-speed automatic transmission (Includes (DQS) outside memory equipped heated power-adjustable vertical trailering mirrors. ), SUNROOF, POWER, MIRRORS, OUTSIDE HEATED POWER-ADJUSTABLE VERTICAL TRAILERING, MEMORY EQUIPPED, UPPER GLASS, POWER-FOLDING AND MANUAL EXTENDING, CHROME Includes integrated turn signal indicators, consisting of 51 square inch flat mirror surface positioned over a 24.5 square inch convex mirror surface with a common head and lower convex spotter glass (convex glass is not heated and not power-adjustable) and addition of auxiliary cargo lamp for backing up (helps to see trailer when backing up with a trailer) and amber auxiliary clearance lamp, LPO, ALL-WEATHER FLOOR LINER, ENGINE, DURAMAX 6.6L TURBO-DIESEL V8, B20-DIESEL COMPATIBLE (445 hp [332 kW] @ 2800 rpm, 910 lb-ft of torque [1220 Nm] @ 1600 rpm) Includes capped fuel fill, (K40) exhaust brake, and (K05) engine block heater. AUDIO SYSTEM, 8 DIAGONAL COLOR TOUCH SCREEN NAVIGATION WITH GMC INFOTAINMENT SYSTEM Plus tax, title and license. Prices include $200 dealer doc fee. See dealer for Stock Numbers. Price contains all applicable dealer incentives and non-limited factory rebates. You may qualify for additional rebates; see dealer for details. NAV, Heated Leather Seats, Sunroof, Turbo, Alloy Wheels, 4x4, SUNROOF, POWER, MIRRORS, OUTSIDE HEATED POWER-ADJUSTA... Bed Liner, DURAMAX PLUS PACKAGE. WHITE FROST TRICOAT exterior and JET BLACK DENALI interior, Denali trim. SEE MORE! KEY FEATURES INCLUDE Leather Seats, 4x4, Heated Driver Seat, Cooled Driver Seat, Back-Up Camera, Running Boards, Premium Sound System, Onboard Communications System, Trailer Hitch, Aluminum Wheels, Remote Engine Start, Dual Zone A/C, Heated Seats, Heated Leather Seats, Heated/Cooled Seats. Keyless Entry, Privacy Glass, Steering Wheel Controls, Electronic Stability Control, Alarm. OPTION PACKAGES DURAMAX PLUS PACKAGE includes (L5P) Duramax 6.6L Turbo-Diesel V8 engine and (VQY) chrome recovery hooks, LPO, (MW7) Allison 1000 6-speed automatic transmission (Includes (DQS) outside memory equipped heated power-adjustable vertical trailering mirrors. ), SUNROOF, POWER, MIRRORS, OUTSIDE HEATED POWER-ADJUSTABLE VERTICAL TRAILERING, MEMORY EQUIPPED, UPPER GLASS, POWER-FOLDING AND MANUAL EXTENDING, CHROME Includes integrated turn signal indicators, consisting of 51 square inch flat mirror surface positioned over a 24.5 square inch convex mirror surface with a common head and lower convex spotter glass (convex glass is not heated and not power-adjustable) and addition of auxiliary cargo lamp for backing up (helps to see trailer when backing up with a trailer) and amber auxiliary clearance lamp, LPO, ALL-WEATHER FLOOR LINER, ENGINE, DURAMAX 6.6L TURBO-DIESEL V8, B20-DIESEL COMPATIBLE (445 hp [332 kW] @ 2800 rpm, 910 lb-ft of torque [1220 Nm] @ 1600 rpm) Includes capped fuel fill, (K40) exhaust brake, and (K05) engine block heater. AUDIO SYSTEM WHO WE ARE Chevrolet Buick GMC of Fairbanks sells new Plus tax, title and license. Prices include $200 dealer doc fee. See dealer for Stock Numbers. Price contains all applicable dealer incentives and non-limited factory rebates. You may qualify for additional rebates; see dealer for details. 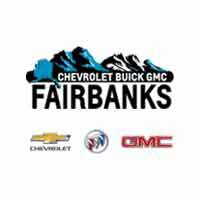 Those who serve at Fort Wainwright and Eielson Air Force Base know they can count on Chevrolet Buick GMC of Fairbanks for a superlative buying experience. Here, we set a higher standard for those on The Last Frontier. Not only do we offer a rotating selection of new vehicle specials, but our knowledgeable staff will help you discern the differences between classic American 1500 pickup trucks. We’re open every day, so feel free to contact us to schedule a test drive – or to discuss your lease or finance options.